Selangor, Malaysia, July 2, 2015 - (ACN Newswire) - According to the International Union for Conservation of Nature, the Asian elephant is now an endangered species. Today, there are only 40,000 elephants left in Asia's mainland and about 1,200-1,700 in peninsular Malaysia. Habitat loss and forest fragmentation are considered the biggest threats to their survival. Much of their habitat has been converted into plantations, housing estates, highways and other human "development schemes". 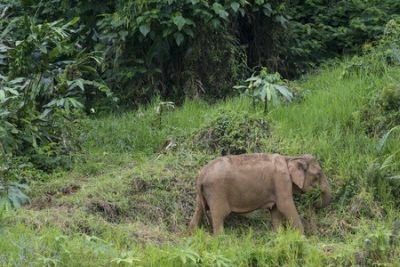 In a recent paper published in the Pertanika Journal of Science and Technology, Suhaida Aini and colleagues used a geographic information system (GIS) to analyse the home range and habitat preference of Asian elephants in peninsular Malaysia. In their study, they tracked two elephants in Northern Johor and Terengganu National Park using satellite tracking technology. The study found that both elephants spent most of their time in the secondary or "logged-over forest". This was due to the abundance of ground grass as a food source within the forest area. Former logging roads in the secondary forest also provided good access for the elephants to move. On average, more than 50% of both elephants' home range occurred in this forest type. However, the elephant in Northern Johor tended to travel more often than the one in Terengganu National Park since much of the logged-over forest habitat in Northern Johor has been converted to oil palm plantations. Another habitat parameter that the study analysed is water source. Both elephants spent 75% of their time travelling in an area of less than 1.5 km away from their water source. The researchers also found a negative correlation between water source and elephant distribution. As the distance from the water source increases, the distribution of the elephant decreases. These findings demonstrate the capability of GIS to provide accurate and reliable data for analysing the habitat preferences of Asian elephants. The study suggests that the conservation of these animals requires good management practices within and outside protected areas. Tel: +603 2697 3400; Mobile: +6019 285 7935.